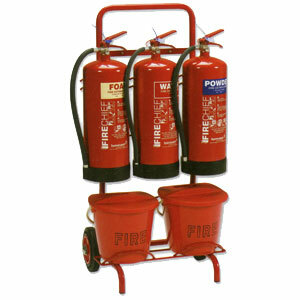 Our triple fire extinguisher trolley is the essential accessory for multi-risk fire-fighting. Ideally suited to many applications such as construction sites, petrol forecourts and heavy industrial sites or any area where mobility is important. It may be that you need to move the fire pint around every day on a busy site. *Fire extinguishers and buckets pictured are not included. These can be selected as optional extras above.